rail on the side deck. from the safety of the cockpit. When we reconfigured Momo, our Mason 43, for blue water sailing, we searched for a way to replace our 4:1 purchase vang with something more powerful. We also needed something that could act as a preventer and steady the boom. Eventually we developed a system of dual off-centered vangs which has proven robust, effective, and easy to use. In fact, these vangs turned out to be our most significant modification to the sailboat’s rig, greatly enhancing performance and safety. 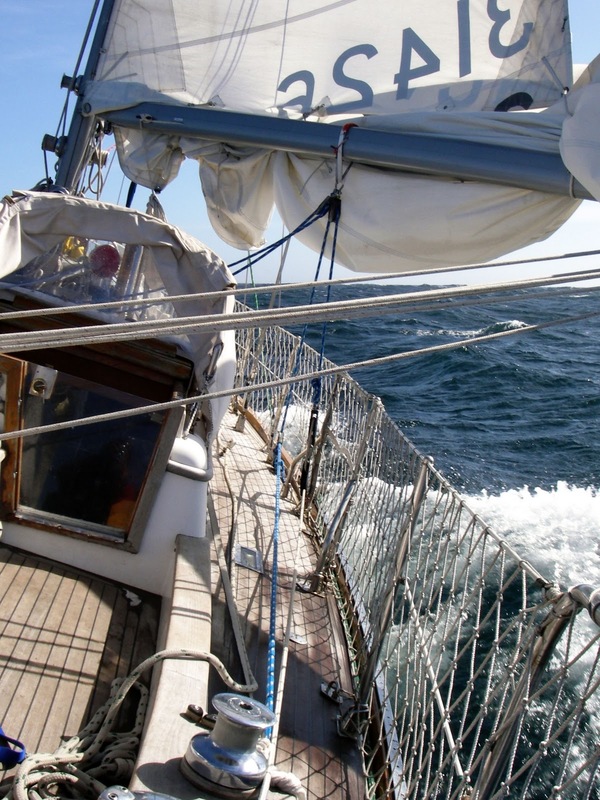 The typical sailboat features a centered vang, which is secured at the base of the mast and runs at an angle between 30 and 60 degrees to a position on the boom a few feet from the gooseneck. The vang keeps the boom down and thus controls the twist of the main, particularly when the boat heads off the wind and that function can no longer be fulfilled by the mainsheet and traveler. Older boats like ours often employ a modest 4:1 tackle, which is barely adequate even on small boats. Skippers with deep pockets can install a masculine piece of hydraulic muscle powerful enough to move mountains but which costs more than a new a mainsail. New boats increasingly sport rigid mechanical vangs which also support the boom in lieu of the topping lift, although I don’t understand why anyone would trade the supple strength of rope for the rigid vulnerability aluminum extrusions and steel. Judging from manufacturers’ warnings and reports I’ve read from people who use them, rigid vangs seem like a heavy and expensive way to replace a fully functional topping lift with a product that offers above all the potential to break. The virtue of the centered vang lies in pulling the boom down without impinging on its freedom to swing from side to side. The boom can be sheeted to any desired position while the vang’s tension remains the same. But such convenience comes at a price. As much as half of the force applied to a centered vang does not actually pull the boom down but rather wastes itself driving the boom into the mast and stressing the gooseneck. Little can be done about that: if the boom attachment is moved forward, the downward pull of the vang increases, but leverage is lost; moving the boom attachment aft increases the vang’s leverage, but decreases the proportion of force actually used to bring the boom down. Furthermore, giving the boom the freedom to swing is not necessarily a good thing. With any kind of seaway, particularly in light winds, the boom bounces around with a violence that benefits neither the rig nor the canvas. And the further the vessel sails downwind, the greater danger it faces from an accidental jibe. Inevitably, measures need to be taken to steady the boom. Often, however, such measures are awkward and unsafe. One common recommendation, for instance, is to rig a preventer to the end of the boom, lead it forward to a block on the bow and bring it back to the cockpit. But that is easier said than done, especially after a jibe at night or in heavy weather. Another way to rig a preventer is to change from a centered to an off-centered vang – by releasing the bottom of the vang from its position at the base of the mast and moving it outboard so that the vang constrains the boom. But a vang that always needs to be moved from one place to another is a nuisance. On Momo we decided to set up an off-centered vang for each side of the boat, with both sides controlled from the cockpit. Not only are these vangs more effective than a centered vang at pulling down the boom, they also act as preventers and help steady the boom in a seaway. Jibing and tacking are easy, and using the vangs and mainsheet we can secure the boom in any position we desire within seconds. Due to the difference in leverage, any tackle that controls the boom from the middle encounters substantially more force than tackle which controls the boom from the end. The forces faced by an off-centered vang, especially the shock loading from a slatting main, can overwhelm hardware, pull fittings through decks, break stanchions, and lift genoa tracks. Thus the vang’s components, especially its attachments to the boom and deck, need to be carefully considered. and are easy to inspect and replace. On Momo we secured the vangs to the boom with a webbing strap. 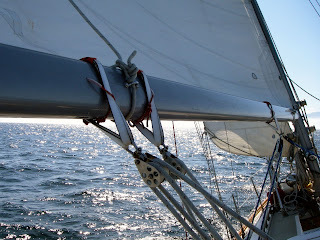 In fact, ever since a stainless boom attachment for our mainsheet sheared while we were motoring through a windless stretch of sloppy seas, we have used webbing straps for all of our boom attachments. They absorb shock and accommodate shifting directions of loads; they are easy to inspect and replace; and they are light and incredibly strong – the 1" wide straps we use have a working load of 3200 lbs. with a safety factor of 5:1. They are also inexpensive – after asking a boatyard crane operator where he purchased his straps, we went to the same place and discovered that they could custom-make any kind of straps we wanted at very reasonable prices. The 2' long straps we use on the boom were made by Grip-Sure Manufacturing in Richmond, B.C., and cost less than $8 each. Compare that to the $40 we might otherwise have spent for a stainless steel boom bail that, tortured by the stress of an off-center vang, would inevitably fail. Each vang has a purchase of 8:1 – the same as obtained from a typical rigid vang – which generates sufficient force to pull down the boom in a strong wind. Moreover, since the off-center vang pulls the boom more or less straight down, it is more efficient than a centered vang. To gain such purchase without using excessive lengths of line or numbers of blocks, the vangs are composed of two cascading tackles. The first tackle consists of a line, the standing part of which is fixed to fiddle block. The hauling part is reeved through a block at the boom, brought down to a block at the midship cleat, and led back to the cockpit where it can be made fast. By itself, it yields a 2:1 purchase. This part of the vang bears the most load, thus the blocks and line must be sized accordingly. On our boat, we use 90mm blocks by Wichard (safe working load of 4,400 lbs.) at the boom, Schaefer’s 704-5 block (safe working load of 2,250 lbs) at the cleat, and ½" line (breaking strength of 8,500 lbs). The line must also be long enough to allow the boom to swing freely to opposite side of the boat. the gross adjustment of the vang. back to the safety of the cockpit. The second tackle bears only half the load of the first and thus can be sized somewhat smaller. The standing part of the second tackle is fixed to a fiddle block secured to a stanchion base about 24" aft of the midship cleat. The hauling part is then reeved back and forth between the fiddle block which terminates the first tackle and the fiddle block that is secured at the stanchion base, and finally brought back to the cockpit where it can be made fast. We use Harken’s fiddle blocks 1559 and 1560 (safe working loads of 1800 lbs) and 3/8" line (breaking strength of 4,400 lbs.). By itself, this second tackle yields a purchase of 4:1. Between them, however, the two tackles yield a purchase of 8:1. Operating the vang involves two steps. First, one makes a gross adjustment using the first tackle. Simply put, one hauls on the first tackle until the fiddle block is brought all the way up to the boom. Then one uses the second tackle to achieve the desired tension and sail shape. The only serious danger with an off-center vang involves tripping the boom in heavy seas. If the boom digs deeply into a wave while constrained by the vang, it could very well snap. With a system like ours, the vang should retain enough elasticity to avoid such a catastrophe. Since the vang’s bottom attachments are situated aft of the chainplates, it does not actually hold the boom all the way out. The distance between the vang’s bottom attachments absorbs shock by allowing the boom to rock back and forth a little while under tension. The ropes and the webbing also stretch. Furthermore, the location of the vang’s bottom attachments also help us recover from accidental jibes. When the wind catches us aback, the boom swings inward a few feet before being stopped by the vang. In this position, the boat actually feels like it’s hove-to. It continues to make enough headway that, by putting the helm hard over, we can bring the stern through the wind again and resume our course. During gale conditions we’ve had the boom dip lightly into the sea, but this is not something I like experimenting with. The best thing is to avoid tripping the boom at all. 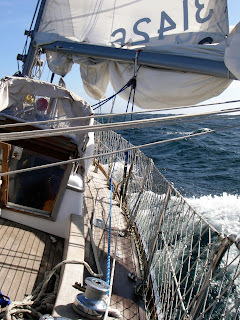 Reefing helps, not only by reducing heel but because each successive reef raises the end of the boom a little further from the deck (this, of course, depends upon the design of the main). Eventually, conditions might require striking the mainsail and flying a trysail without the boom. In the absence of boom gallows, the vang can center the boom and hold it steady. In any event, even if the boom trips in the sea, the rig faces less danger from an off-center vang than from a preventer run forward from the end of boom. Whereas the vang might break the boom, the preventer might generate sufficient torque to bring down the mast. Building a quality robust vang is not exactly cheap. Our vangs were designed to sustain a safe working load in excess of 3000 lbs. Based on the catalog of a leading US chandlery, the blocks we used retail at around $650, although a little bit of searching can yield significantly lower prices. To that one needs to add the cost of line and other incidentals needed to secure the vang and lead the falls back to the cockpit. Still, compared to other alternatives a vang like ours is a veritable bargain and much more versatile. Forespar’s rigid mechanical vang (‘Yacht Rod’) for a boat our size retails at more than $1800, while setting up a hydraulic vang for a boat our size costs around $2800. With all the money you save, you can buy yourself something nice – perhaps a little rowing dinghy. And when you stow it on deck, shove it right against the mast, because there won’t be a centered vang to get in the way. This is an interesting article. I skimmed over it and will come back to it to read it more in depth. I really like the idea of webbing attachments on the boom rather than SS fittings. I will be using more webbing attachments where appropriate. Our Ingrid currently does not even have a vang. I removed it as more of a danger than a benefit as the one that was on the boat was more of a second "main sheet" that was attached to the cabin top with a pad eye about two feet aft the mast. Thanks so much for describing your system in such detail. I have no boom vang and really was not to keen to be drilling or welding attachments to both the mast and boom. The price for a factory vang for my vessel would be very costly, being 39 tons and 62' feet overall. I really like the system you have described, and expect that I may be able to utilize the 16' beam to advantage using your system. Thanks again for taking the time to write your informative article.